Tuesday, February 26 at 10:00 am. For more information see STRAND Cost Share Program. Thursday, February 28 at 6:00 pm. 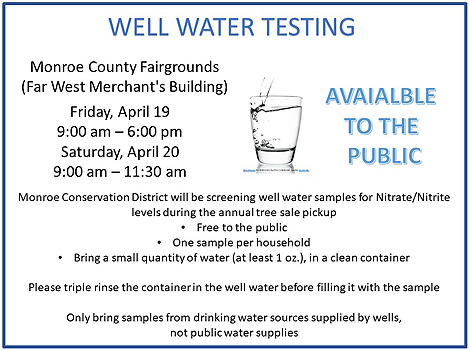 The Monroe Conservation District will screen drinking water well samples for nitrate/nitrite during tree sale pickup hours. The screening is sponsored by the Monroe Conservation District and the Michigan Agriculture Environmental Assurance Program (MAEAP). There is no fee to participants for this service. The screening is open to everyone who uses a private well for drinking water. Please do not bring samples from public water supplies or non-drinking water sources. Only drinking water well samples will be tested. You do not have to use a special bottle for this screening. Any small clean glass or plastic jar will work—one ounce of water is enough. Please triple rinse jar and lid in the water to be sampled just prior to collecting sample. No used water bottles or cups please. For more information or to register for any of these events please call 734.265.9311 or email Catherine at catherine.acerboni@mi.nacdnet.net.